Boil potatoes whole. Do not over-cook potatoes or salad will be mushy. When potatoes are done drain right away, peel and let cool. Put in refrigerator to chill. When chilled completely, cut them up into medium sized cubes and put in a large bowl. Put back into fridge to keep chilled. Combine celery and olives into finely minced pieces. Add to potato mixture. Open can of shrimp and drain well. Rinse off shrimp in the can, and squeeze dry with can cover before removing from can. Flake shrimp well between fingers and add to potato and veggie mixture. Mix mayonnaise into salad and add salt and pepper to taste. If you want to use dill, chop it finely and add it now. Refrigerate until ready to eat. When ready to serve, place potato salad on a few leaves of lettuce, serve with cucumber wedges. Oor serve inside a hollowed out tomato or bell pepper or cucumber. 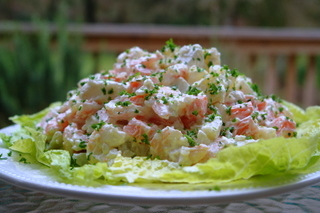 This entry was posted in Helen's Kitchen, Salads and tagged potato salad, Shrimp. Bookmark the permalink.